An interdisciplinary team of researchers "investigated publicly available Facebook proﬁles of freshmen undergraduate students within one large state university Facebook network" and invited 188 of those freshmen to be interviewed for a health study. At the end of the interview, they told the freshmen that they had been selected using their public Facebook profiles. "Participant responses included endorsement (19.7%), ﬁne (36.4%), neutral (28.8%), uneasy (9.1%), and concerned (6.1%)." The researchers acknowledge that 6 percent minority but conclude that "publicly available Facebook proﬁles of older adolescents are viewed as public spaces by both the adolescents themselves as well as the legal system." The Times Higher Education reports that in 2010, the director of research in the University of Sheffield Management School told Professor Stuart Macdonald to suspend his research, even though the professor had done nothing but mention another professor's research during a "discussion on research ethics and integrity." The story reports, "Fifteen days later, [Macdonald] received an email from the chair of the research ethics committee, Richard Jenkins, saying a 'misunderstanding' had occurred, although he was offered no apology or further explanation." Macdonald filed a formal complaint about his treatment by the REC, but it was dismissed. The case echoes the experience of Bernadette McCauley, who also received an order to suspend all research from an ethics committee that had no idea of what it was doing. At the Ethics Rupture conference, Martin Tolich described his work as convenor of the New Zealand Ethics Committee, described on its site as "a national ethics advisory committee, based in Dunedin, serving any researcher not eligible for health or institutional ethics review." Tolich listed several innovations, the boldest of which is the voluntary nature of the review. "No researcher is mandated to submit his or her proposal to NZEC," the site explains. "It is a voluntary service and fees are based on koha." If the committee wants to attract proposals, it will have to persuade researchers of its wisdom, rather than threatening them with penalties. New Zealand researchers affiliated with health institutions or universities are still stuck with mandatory review. But it will be fascinating to see what ethics review looks like when it is no longer mandatory. Today marks the first anniversary of the deadline for comments on the ANPRM. The federal government received more than 1100 comments in response to its proposals and queries. I have heard nothing official, and only vague and contradictory rumors, about what progress, if any, has taken place in the past year. Meanwhile, I am attending Will C. van den Hoonaard's Ethics Rupture conference, and I am delighted to meet in person so many people with whom I have corresponded and whose work I have read. But I am saddened to hear Canadian scholars' frustration that the revision of the TCPS has not done more to allow them to conduct research according to the ethical and methodological standards of their disciplines. The American Journal of Sociology has published my review of Laura Stark's Behind Closed Doors. 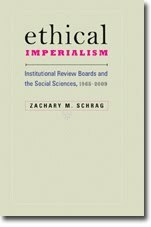 I describe it as an "illuminating account of how ethics review really works," but note that "Stark’s reluctance to condemn [IRB] behavior sets her apart from other observers of IRBs in action" and that it is "a stretch for Stark to claim that today’s IRBs use 'a decision-making model that stabilized in the 1950s and 1960s.'" For my comments on Stark's dissertation, on which the book is based, see "How IRBs Decide--Badly: A Comment on Laura Stark's 'Morality in Science.'" Andrew Gelman revisits IRB nightmares at Statistical Modeling, Causal Inference, and Social Science. Mark Israel, Winthrop Professor of Law at the University of Western Australia, sees problems with mandatory ethics review but doubts that they can be fixed by limiting such review to projects involving "specific vulnerable groups."